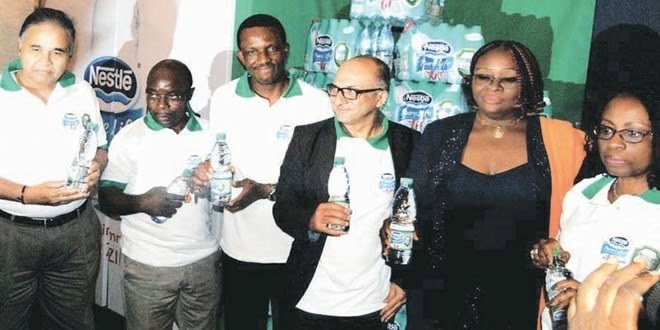 In furtherance to its food fortification initiative Nestle, at the weekend in Lagos, launched its Nestle Pure Life Protect, a variant of its bottled water brand, Nestle Pure Life Water which is fortified with zinc. Speaking on the occasion, the MD, Nestle, Darnesh Gordhon, noted that Nigeria has challenges of water supply and added that the introduction of the Nestle Pure Life Protect was in recognition that good hydration is at the core of healthy lifestyle. “We believe strongly that good hydration is at the heart of healthy lifestyle. We also believe that when it comes to hydration, bottled water is the healthiest packaged beverage due to its absence of calories, controlled origins, taste and convenience,” he said, adding that Gordhon who said the new product was a demonstration of the company’s commitment to create innovative healthy hydration solutions in Nigeria, reiterated Nestle’s commitment to responsible water management through its value chains. imperative. He added: “bottled water and healthy family hydration” is the goal of his organisation. Also speaking at the launch, the Country Business Manager of Nestle Water, Adewale Ojo, who note that Nigeria has been identified as a market with moderate risk of zinc deficiency said the new addition to nestle product portfolio would help Nigerians make up for the identified deficiency in zinc. Ojo also said that the New Nestle pure life Protect which contains 2.3 mg of zinc was a result of market research. “This product was tested among various groups of consumers and the result we received necessitated the introduction of the product,” he said. He pledged his organisation commitment to ensure provision of quality drinking water with the right balance of essential minerals. His words: “Our commitment to Creating Shared Value and our principle-based approach to running our business stand front-and-center as we pursue our objective of being the reference for financial performance in our industry, because we want to achieve this while also being trusted by all stakeholders. “This, we have passionately demonstrated when we Launched Water Education for primary school teachers in October 2012 with its pilot implementation phase in three LGAs in Lagos, and now as I speak, we are teaching Water Education in five LGAs in Lagos with a plan to roll out to more states.” “In Nestle, we are committed to delivering innovative products that will meet the expectations of the Nigerian consumers and without any iota of doubt,” Ojo said. This story was published in Newswatch Times on November 2, 2013. Pharmacists have attributed the recent crisis rocking the Pharmacy Department, Federal Staff Clinic, Jabi, Abuja, to the high-handedness and poor management skill of its Chief Medical Director, Dr. (Mrs) Chinwe Ifeoma Igwilo, even as they called for her probe. Pharmacists, under the platform of the Pharmaceutical Society of Nigeria (PSN) who condemned her poor treatment of colleagues, said that proper probe of her department will arrest the confusion in the clinic and ensure its effective management. Last week, 20 protesting pharmacists shut down the entire pharmacy unit of the Federal Staff Hospital Abuja over what they termed unlawful treatment of pharmacists in the hospital and the transfer of the Head of Pharmacy Department, Pharmacist Taiye Olugun. The pharmacists, who were angry over the Chief Medical Director’s handling of affairs of the hospital, said things came to a head when she transfered the head of department. Pharmacist Douglas Tamunomielbi, who led his colleagues, said the management sees pharmacists as mere salespersons and does not accord them their rightful places in the hospital. Another pharmacist, Hasiya Daura, said the CMD had given the HOD 24 hours notice to return to the Federal Ministry of Health while his office filing cabinet was removed and placed downstairs while his name and designation were removed from his office door. Meanwhile, the CMD who was seen trying to unlock the door of the pharmacy added that patients would not be made to suffer for actions of the pharmacists. Patients were seen hanging around the pharmacy with their prescription papers waiting to be attended to. Mrs. Igwilo who reluctantly spoke to journalists claimed she merely transferred the HOD following an investigation being carried out against him concerning his alleged involvement in removal of some drugs from the hospital. She said reports of the finding would be submitted to the office of auditor general who would advise on the necessary action to be taken. Photo:L-R: Lekan Asani, CEO GlaxoSmithkline West Africa and Chairman, Conference Planning Committee; Olumide Akintayo, National President, Pharmaceutical Society of Nigeria (PSN) and Pharm. Victor Okwuosa, National Secretary, PSN, during pre-conference press briefing on the 86th annual National Conference of PSN at its corporate office, Pharmacy House, Anthony Village, Lagos, last Thursday. According to her, the minister of health is in the best position to respond to the issues but would report the matter to the permanent secretary. Reacting, President of PSN, Olumide Akintayo, who led the call in a petition urged the Head of Service of the Federation, to institute a panel of enquiry to investigate the conduct of Igwilo, in the management of affairs of the hospital since her assumption. The petition which was signed by Pharm. Ologun Taiye Joseph, Pharm. Bada Niyi Joseph, Pharm. Daura Hasiya, Pharm. Adole Jane, Pharm. Enekebe Jennifer E., Pharm. Chika Ubajaka, Pharm. Adenike Adeladan, Pharm. Talent Olawunmi, Pharm. Douglas Tamunomiebi, Pharm. Kromsing Gabriel. Akintayo, in a letter dated October 28, 2013, addressed to the Head of Service of the Federation, Federal Secretariat, Garki, Abuja, wrote: “I am compelled by recent disturbing events at the Pharmacy Department Federal Staff Clinic, Jabi Abuja to reach out to your office. The official account has been communicated to the chairman of the board of the Federal Staff Clinic, Abuja, Alhaji Ladi Hassan. The petition which was copied to Minister of Health, Permanent Secretary, Federal Ministry of Health (FMOH), Director Human Resources – FMOH, Director Food and Drug Services – FMOH, Director Hsopital Service, FMOH, The Registrar:- Pharmacists Council of Nigeria (PCN) further stated: “Various consultation with Alhaji Ladi Hassan clearly suggests that the very unwholesome event in this very strategic establishment is certainly not getting desired attention, hence a need to refer the matter to your exalted office.” He added: “To as matter of national emergency institute a panel of enquiry to duly investigate the conduct of the Medical Director, Dr. (Mrs) Chinwe Ifeoma Igwilo, in the management of affairs of the hospital since her assumption of office as the head of the hospital right from the status of the hospital as a federal staff clinic.” He urged the Minister of Health to direct the investigation of the role of the medical director in collusion with federal audit unit of the ministry in the unsubstantiated allegation of theft she levelled against the HOD pharmacy, Pharm Ologun T.
According to him, the Minister should ensure the immediate constitution of the Drug Revolving Fund Scheme in line with the provisions of the national drug policy (2005). Akintayo also called for the reconstitution of the Drug Therapeutic Committee, Procurement Committee and ensure that the Tenders Board functions properly. He further urged the Minister to direct that all posted and disengaged pharmacists, including HOD Pharmacy, Pharm Ologun T.J and Pharm. Douglas Tamunomiebi should be immediate recalled back to their duty post to render needed services. The PSN President said the Minister should direct that all casual labour should to stop as this is contrary to relevant labour laws of the nation. • The reign of impunity been orchestrated by Dr. Chinwe Igwillo the medical director of the Federal Staff Clinic, Abuja. Fall-outs of this directly include breaches of the Procurement Act, the Fiscal Responsibility Act, Public Service Ethos & Regulations as well as obvious dimensions of alleged corruption. We have therefore through a separate memo forwarded the comprehensive petition of the affected pharmacists and appropriate annexure for your information and necessary action. • Unethical practices of some pharmacists of the Pharmacy Department of the Pharmacy Department of Federal Staff Hospital (FSH), Abuja, which the Pharmaceutical Society of Nigeria will officially refer to the Pharmacists Council of Nigeria. • A case of established physical assault on a pharmacist at the instance of Dr. Igwillo and Mr. Kanu which we shall take up with the Inspector General of Police. The society called for full investigation into the activities of the Medical Director, FSH Abuja with regards to the employment and termination of employment of pharmacists at FSH, Abuja. 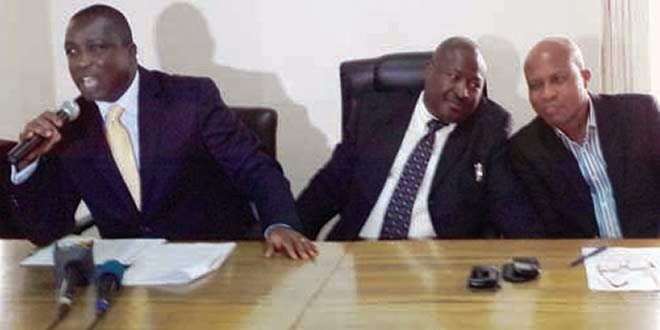 The PSN said that investigation should establish culpability with respect to violations of the Procurement Act, Fiscal Responsibility Act, ICPC Act and other breaches of available Anti-corruption Acts in addition to vitiations of Public Service Rules & Ethos. The pharmacists also called for a probe of the personnel who engaged in dispensing of medicines in the Pharmacy Department of FSH, Abuja contrary to the provisions of the poison and Pharmacy Act Cap. 535. In less than 48 hours, all roads will lead to the Kwara State Government Banquet Hall, Kwara State where the much expected 86th annual National Conference of the Pharmaceutical Society of Nigeria (PSN) – ‘Harmony’ 2013 will take place. The conference with the theme: ‘Evolving Best Practice in Patient Care” will be declared open by Alhaji Abdulfatah Ahmed, Governor of Kwara State, while the opening ceremony will be chaired by Justice Mustapha Akanbi (Rtd. ), a former President of Court of Appeal and Former Chairman ICPC the next day. Addressing journalists in his Pharmacy House office, Maryland Lagos, the PSN National President, Olumide Akintayo noted that this year’s conference will come with innovation in I.T and re-introduction of a scientific dimension which will feature poster presentations. Also on the cards will be the maiden Past President’s nite, an important forum designed to honour past leaders and legends of the pharmacy profession in Nigeria. Other highlights are the gala-nite, town-hall meeting, reception cocktails and unlimited social rendezvous. The Annual General Meeting and elections will hold on Thursday, November 7, while a banquet will bring all activities to a climax on the same day. Concerned about the lingering disharmony and attendant crisis in the health sector, Akintayo urged the Yayale Ahmed-led Presidential Committee on Inter-Professional Relationships in the Public Health Sector to embrace principles of equity, justice and fair-play as a means of ending protracted crisis in the sector. The committee, headed by former Secretary to the Government of the Federation, Yayale Ahmed, has Prof. Placid Njoku, Dr. Timiebi Koripamo-Agary, Julius Adelusi-Adeluyi and Prof. Dennis Agbohlahor as members. The committee is charged with re-addressing contentious issues on non-skipping of COHHESS 10 in line with the judgment of the National Industrial Court; modalities for the payment of consultancy and specialists allowance for healthcare professionals in the health sector; pay relativity as reflected in the 2008 job evaluation report and review of retirement age for health workers from 60 to 65 years, among others. The PSN, according to their president, called on the committee, which they hope would establish “a new foundation for a health sector presently in disarray”, to embrace international best practices in the management of public health workers. Akintayo said: “Fundamental is the reality today that even the World Health Organisation (WHO) affirms that modern healthcare is too complex to be left to any one profession in the health sector. The Yayale-Ahmed committee must facilitate strategies and policies in the workplace that strengthen and support the health workforce and in turn, have positive impact on patient outcomes and organisational cost effectiveness.” Also, the National President lauded the Federal Government’s reconstitution of the Pharmacists Council of Nigeria (PCN), which has been non-existent since 2007. Every part of the body needs nutrients from foods and if what we eat and drink is not properly digested they cannot be absorbed neither can they be utilized by the cells of the body for energy, growth and repair. The result is that we get malnourished, get sick, age prematurely and die earlier than we should. Have you ever wondered why you sometimes feel so bloated after a great meal? You probably resorted to spending more money on some health salts to flush your precious food out of your system. It is worthy of note that many heath foods promoters are smiling to the bank on sales of food supplements that are said to heal a long list illnesses. Included somewhere in the middle of such lists are indigestion and constipation, which to me are really the crux of the matter. Somehow constipation and indigestion always seem to be hidden in the mist of so much talk that they always go unnoticed.To give you a few guidelines that would help you benefit from the foods you are eating you need to understand a few things about the digestive system. Carbohydrates start digestion in the mouth through chewing and mixing food with saliva. Proteins start digestion in the stomach, which contains acid and enzymes. 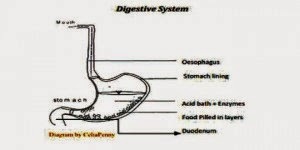 Fats are emulsified in the first part of the small intestine, the duodenum. The first foods that get into the stomach lie closest to the stomach wall and are digested first as the stomach is in continuous wavelike motion likened to a photographer developing pictures in a pan of chemicals. This motion is called peristalsis and the motion can start even at the sight, smell or expectation of food. When food is churned and is sufficiently mixed with acid this acidic chime triggers the contraction of the pyloric sphincter at the bottom of the stomach which opens to let out a small portion of chime into the duodenum. As soon as the chyme touches the alkaline mucus membrane of the small intestine the sphincter promptly closes. Switch off any form of anger or anxiety before you sit down to eat. The pyloric sphincter is controlled by the nervous system and any negative signal like fatigue, anxiety, exercise or medication can hinder the opening of the pyloric sphincter and food will stay in the stomach too long. So relax, turn off the T.V as this can bring unfavourable news and disrupt the flow of digestive juices. Food is meant to nourish your body. Anxiety can make you want to eat, so control your thoughts and ask yourself why you think you want to eat, is it genuine hunger or boredom? If you drink while eating you will dilute the stomach acid and the protein will not digest fast enough the carbohydrate can ferment and you will bloat and suffer a lot of discomfort. You may drink water 30 minutes to 1 hour before or after a meal. Ever seen a goat that did not chew cord? Have you ever seen a cat that did? Your teeth are natural grinders and were put there by God for the purpose of grinding carbohydrate foods (foods from plant origin) in order to increase their surface area and allow digestion of starches as well as expose the protein within in readiness for their digestion in the stomach. Eat raw fruits or vegetables with live enzymes first and then proteins before the starches. The enzymes in the fruits and or vegetables aid the digestive enzymes in the stomach in digesting the incoming proteins. Remember carbohydrates are not digested in the stomach except momentarily in the upper part of the stomach. If you swallow your starch first and chew your meat till it is liquid as we grew up to do in Nigeria, your protein which is now in liquid form will move to the bottom of the stomach and leave the stomach partly undigested as it flows out with the next batch of chyme. Fruit and vegetables add bulk and force you to chew which prompts peristaltic movement and elimination time is shortened. The digestive system uses a lot of energy so eating too much at a time can put extra stress on your digestive system. You may have noticed that you feel sleepy after eating a large meal. As six states in the country struggle with cholera which has already affected 373 persons with 74 succumbing to the disease, action has commenced to initiate sanitary precautions to control it. This is even as 30 other states, including the Federal capital territory (FCT) is now on alert to prevent cross infection. The action is coming on the heels of warnings by government authorities and experts for the public to do everything to stop open defecation and ensure access to clean water. For instance, the Minister of Health, Prof Onyebuchi Chukwu, on Monday, assured that the ministry had proffered ways of checking the infection, just as experts on Tuesday, urged governments at all levels to reintroduce sanitary inspection to control further outbreak of cholera and other communicable diseases. Prof Chukwu, gave the assurance at the 2013 Physicians’ Week, organised by Nigerian Medical Association (NMA) in Abuja, while addressing journalists, confirming that the six states where the disease had been recorded are; Lagos, Oyo, Ogun, Zamfara, Katsina and Plateau. The Health Minister who urged Nigerians to ‘henceforth stop and control open defecation,’ further called for the provision of portable and clean water and the improvement of personal hygiene in homes and public places. According to World Health Organisation (WHO), cholera is caused by acute enteric infection through the ingestion of a bacterium known as vibrio cholerea found mostly in water and food that has been faecally contaminated. Also, Wikipedia, the free online dictionary, describes cholera as an infection of the small intestine caused by the bacterium `Vibrio cholerae’ with the main symptoms as watery diarrhoea and vomiting. Transmission occurs primarily through drinking water or eating food that has been contaminated by the faeces of an infected person, including one with no apparent symptoms. In separate interviews, experts agreed that the fight against cholera required concerted efforts by all tiers of government and Nigerians in general. Dr Femi Balogun, the Medical Director, Sheffi Private Hospital, Egbeda, Lagos, urged Lagos residents to provide standard toilet facilities in their respective homes for healthy living. He said that regular sensitisation and awareness campaigns to educate residents on good hygienic practices were being carried out by health personnel. Balogun said that sanitary inspectors should be mandated to ensure that every house had toilet facility. Also, Dr Femi Afolabi, a dietician at the Federal Medical Centre, Ido-Ekiti, said that more efforts should be made to educate food vendors on appropriate and hygienic ways of food preparation. Afolabi advised the public to boil their drinking water and also wash their vegetables before consumption, to avoid contacting the disease. The dietician also urged people to maintain clean and healthy environment to prevent cholera epidemic and outbreak of other communicable diseases. Dr Adewunmi Alayaki, a general physician at Isolo General Hospital, Lagos, stressed the need to strengthen the sanitary inspectors for proper monitoring of the environment, to prevent cholera. “We know there are people saddled with the responsibility of sanitary inspection, not only in the North, but also in other parts of the country. “This has to be revived. There is the need for border surveillance, monitoring and inspection of our environments for early detection of diseases outbreak,” he said. 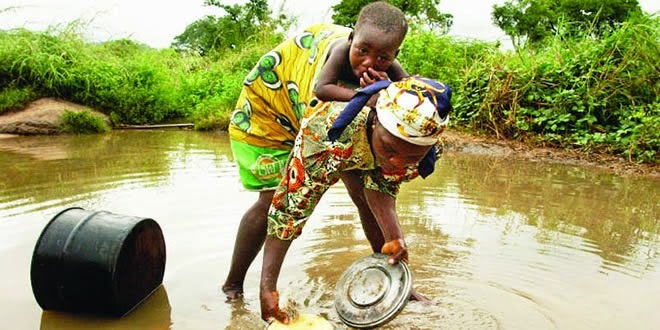 Reports has confirmed that some parts of the country – Plateau, Sokoto, Zamfara, Ogun, Oyo and Lagos States – had at different times this year suffered the disease. In July, five people were reported dead in Ogun, while eight people died and 12 others hospitalised in Egbeda Local Government area of Oyo State in September. The disease also infected no fewer than 536 people and killed 46 in Zamfara in October. In Plateau State, nine people died out of the 136 in some parts of the State. The Lagos State Commissioner for Health, Dr Jide Idris, bemoaning the death of three out of the 13 cases reported in more than five local government areas of the state said: “Although, many of the cases have been treated and patients discharged in several health facilities, three have been confirmed dead. “Surveillance and investigation discovered that a large number of the cases came from Amuwo-Odofin, Apapa, Lagos Island, Ajeromi-Ifelodun, Oshodi-Isolo and Surulere Local Government areas, Idris said. “People should henceforth stop and control open defecation and ensure provision of portable and clean water and the improvement of personal hygiene in homes and public places,” the Commissioner said. He said that further surveillance and investigation, especially in Oshodi-Isolo and Surulere Local Government areas, identified African food salad, popularly called `Abacha’, as the suspected source of the disease. “Water was the source in Ikare community in Amuwo-Odofin, and Apapa Local Government areas,” Idris said. Meanwhile, the Lagos State House of Assembly on Monday urged the federal government to direct the relevant agencies to sensitise the public on how to safeguard themselves against the spread of cholera, which had claimed some lives in the last few weeks. The State Assembly also called on the state ministries of health and Information and strategies to put measure in place to ensure that residents observe proper hygiene in order to curb the spread of the disease. The issue came up under matter of urgent public importance which was raised by the Chairman, Assembly Committee on Health Service, Hon. Suru Avoseh, representing Badagry constituency II. He said: “The outbreak of cholera in some parts of the country including Lagos State has been reported, and this needs to be properly managed to prevent it spread.” “It is a contagious disease, we have to guide against its spread because already 13 cases have been reported while three deaths have occurred. So prevention should be emphasised.” Avoseh pointed out that what people eat should be carefully prepared, adding that: “The African salad, ‘Abacha’ is regarded as a possibility of causing the disease.” The lawmaker explained that sensitization programme was not to intimidate the public but as a way of creating awareness of the danger inherent in the spread of the disease. In his comment, Hon. Rotimi Olowo who represents Shomolu constituency I said it was not only ‘abacha’ that is dangerous to eat but also that the environment where food is prepared should be in good hygiene. According to Olowo, “the local government authorities should begin to inspect all the food vendors to ascertain the environment as safe not to endanger the lives of the residents.” On her part, Funmilayo Tejuoso, representing Mushin constituency I, explained that “cholera had been eradicated in the 1960s. “So I see no reason why we cannot do the same now,” she added. The lawmaker advised the public to be wary of water they consume including the so called ‘pure’ sachet water and the one in bottle. According to him, “For the purpose of clarity and context, the unfortunate communal conflict in Obi Local Government Area of Nasarawa State in September, 2013, resulted in a sudden and dramatic increase in the population of Namu, when 7,000 Internally Displaced Persons (IDPs) arrived the town following their displacement from Assakio. “Some of the IDPS kept moving within Plateau and settled with relations in Kwande, Kurgwi and Bakin Ciyawa, all in Quan’anpan LGA. Governor Jang immediately directed the State Emergency Management Agency under the Chairmanship of the Deputy Governor, Ignatius Longjan, to offer necessary assistance to the displaced.” Yiljap said, “Since then, more steps have been taken to mitigate the spread of the disease and ensure that those who had been on admission received the required medical attention. In the latest effort, a joint review and strategy meeting was held by the management agencies, including the Ministry of Information and Communication.” He added that among other measures, government has undertaken to curb the disease to provide clean and safe drinking water, engage in sanitation exercise to evacuate refuse sites within the town, while UNICEF is to provide health kits and undertake public education through sensitization and advocacy as more drugs is to be prescribed in the health centre to better manage the epidemic. 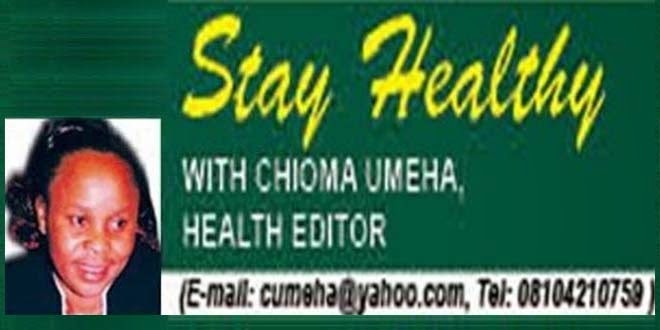 The commission stressed that the health experts in the state has responded adequately to the health challenge that was reported over the weekend in Jengre community in Bassa Local Government Area of the state. He said about 24 patients who were on admission were diagnosed by the Epidemiology Unit of the Ministry of Health, adding that none of the reviewed cases was compatible or fitted the case definition of cholera, rather the cases, as presented, were mostly diagnosed of malaria. Yiljap called on people of the state to observe basic hygiene, keep away from unsafe water sources, fruits and vegetables which sources are uncertain, wash their hands and keep flies away as ways of promoting greater health. This story was published in Newswatch Times on October 31, 2013. When her story broke recently, a number of sympathetic Nigerians expressed concern, giving her family hope that succour will soon come their way. However, several months have gone without help from anybody for young Fatima Usman as she continues to battle two life threatening ailments at the same time. Like her peers, Fatima had the dream of running around with her siblings and friends, studying to excel in school and become a successful legal luminary. Today, all these seem a tall dream as she silently awaits death with unusual calmness for a child of her age. At five, Fatima Usman’s life is gradually ebbing, and like a candle in the wind may be snuffed out soon, if urgent help does not come her way. According to the medical diagnosis, little Fatima has a heart disease and a life threatening malignant ulcer rapidly spreading to other parts of her body, and is about to render her armless. Before the diagnosis, Fatima was a bubbling child with big dreams, high hopes and strong-will. Neither Fatima nor her parents anticipated such conditions she presently lives with until two years ago, precisely 2011, when she suddenly developed incessant unusual body temperatures. Narrating the story, her mother, Wunmi Usman said: “In 2011, we noticed she was always getting sick and running very high temperature. We took it as malaria and gave her malaria drugs. The temperature stopped for few days but later came back. We took her to a nearby hospital and she was treated for malaria again.” After several days of persistent ill-health which caused loss of weight, Wunmi said she took her daughter to a general hospital where she was diagnosed with a hole-in-the heart. “We had taken her to a private hospital and at the hospital, we were referred to the general hospital where it was discovered that she has a hole in her heart and would need to travel to India for treatment,” said Wunmi. While still thinking of how to raise the needed money, another tragedy befell the little girl and her family. She was struck by another ailment. “We were still thinking about how to get the money, when one day in 2011, she was sent on errand, and on her way back, she fell and injured her right arm by the elbow. We applied some ointment to the elbow to reduce the pain, thinking the pain would soon go away. “Before we knew what was happening, the hand began to swell up. We started to apply treatment to it, but there was no improvement. We took her to the hospital where she was treated but, we were surprised that it developed pores at the elbow, some days after the treatment at the hospital. When we took her back to the general hospital, the injury had worsened,” her mother reported sadly. “It was at the general hospital that the injury was diagnosed as ulcer. Right now, the hospital said we need N2.5million for the treatment of her heart and hand.” Wunmi concluded with a sigh of frustration. Fatima’s mother also said that she was happy when neighbours drew her attention to her daughter’s story in the newspapers after exhausting all available means of raising money. She further said: “I was elated and hopeful that our long search for a lasting solution might be around the corner.” However, she said that the hope is fast turning into despair as help is yet to come their way. The search for solution to Fatima’s health complication appears far-fetched. Her mother, barely able to hold back her tears pleaded with well-meaning Nigerians to come to the financial aid of the family so as to save Fatima’s life. 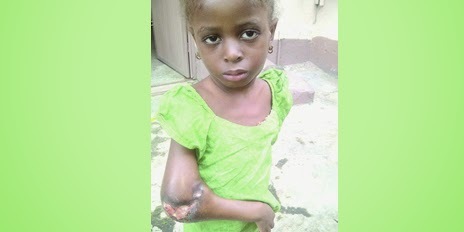 “I want Nigerians to help my daughter; I have no means of raising the money. I want them to help us so that Fatima would not die,” she appealed, in between tears. This story was published in Newswatch Times on October 26, 2013. Lagos State Governor, Mr. Babatunde Fashola (SAN), Monday pledged to support any initiative aimed at increasing middle management surgical capacity across West Africa saying such increase in trained middle management surgeons would help check capital flight as a result of people seeking treatment abroad from the sub-region. Governor Fashola, who spoke when he hosted Council Members of the West African College of Surgeons during their courtesy visit at the Lagos House, Alausa, said the objective of such initiative would be to keep the people within the sub-region whenever there was a need for any surgical intervention. Addressing the Council Members led by the College President, Professor Herve Yangni- Angate, he restated his support to every initiative by the College to improve health services in the country. The governor said: “I believe that the objective which you have so clearly articulated is to keep our people, at the very worst, within the sub-region whenever there is a need for any surgical intervention. I believe it is realizable in a very short term. “We welcome the initiative to increase middle management surgical capacity across the sub-region and whatever support that we can give in terms of the expeditious consideration of the processes as you have requested be sure that I will give them as soon as I become aware of what needs to be done and where the processes lie,” Fashola said. Pointing out that the Lagos State Government has invested much in the health sector to achieve the same objective, he declared, “So we see you as worthy partners. We have built all the hospitals, almost, built all the health facilities. But, truth be told, hospitals don’t treat. It is very good health workers who do. So we welcome that”. Governor Fashola also pledged to take healthcare to the grassroots in the state. His words: “Some of the things we have done here at the local level are aimed at re-awakening the primary healthcare system. We are committed to ensuring that at least every one of our 57 local governments has a 24-hour functional primary healthcare system. We just opened the sixth one last week”, the governor said. He said the objective was to reduce pressure on doctors in secondary and tertiary health institutions by categorizing the health challenges that could be taken directly to secondary and tertiary hospitals and those to be treated at the primary healthcare level. “Sometimes you hear that doctors see 50 to 60 patients a day, that is because all the patients go to one place. If we can deal with malaria, deal with tuberculosis, HIV Screening, antenatal care, regular checkups, simple surgeries, cuts and bruises at the local level; I think we would have really reduced the pressure”, the Governor said. He added: “Once we stabilize, we are now going to make access to secondary facilities dependent on referrals. So, if they don’t refer you, then you must go back and start from the bottom of the ladder except, of course, emergencies and life-threatening situations”. Governor Fashola disclosed the plan of his administration to open up the idle capacity existing in the private sector through the use of health insurance. He explained that with the introduction of health insurance, the capacity of the people to pay for treatments would increase, leading to a growth in the sector. “In that way, I think, doctors and health practitioners across board will ultimately be the beneficiaries of this, because I reckon that there is a lot of idle capacity there, and it is because people can’t pay. But if you put insurance as a boost, it will help people to pay for treatments”, the Governor said. Describing the initiative as “a serious business for us in Lagos healthcare”, the Governor declared, “We think that opportunities for employment, economic prosperity for our health workers is enormous”, adding, however, that such prosperity was going to come on the basis of skill development and competition. He explained further: “Rather than uniform wages, surgeons who can perform more complex surgeries deserve to be paid more, and they will be paid on the basis of their skills, they are professionals marketing very specialized skills”. Responding to the request for land by the Council members to build a College for the training of middle management surgeons, Governor Fashola disclosed that his administration has initiated a policy that would create what he called a medical village in the state. Explaining that the policy was initiated in response to the expression of interest by many Nigerian doctors abroad who have indicated their intention to come back home, but who insist that they want to open their own medical shops, clinics and hospitals, the Governor said. He added that the medical village would be a place where the different medical segments would practice in a cluster of interdependency. Earlier, in his opening remarks, the College President, Professor Yangni-Angate, paid glowing tribute to Governor Fashola for the tremendous achievements of his administration in the last six years, saying, it was an indication of his care for the citizens of the state. The President, who said Fashola, was the first governor of the state to grant the College Council the request for a courtesy visit and a place where the College will build facilities for training of surgeons to help address the manpower shortage in the health sector within the sub-region. Yangni-Angate added that it would also enable the college address the problem of accommodation. He later presented a book on the history of the 50-year-old institution to the governor. Also present at the occasion were the Deputy Governor, Hon.(Mrs.) Adejoke Orelope-Adefulire, Secretary to the State Government, Dr. (Mrs.) Oluranti Adebule, Head of Service, Mrs. Oluseyi Williams, Commissioner for Health, Dr. Jide Idris and his Information and Strategy, Special Duties and Physical Planning and Urban Development counterparts, Mr. Lateef Ibirogba and Dr. Wale Ahmed. Others are Special Adviser Public Health, Dr. (Mrs.) Yewande Adesina, Professor (Mrs.) Subomi Ogedengbe, College Registrar Dr. Adedayo Adewunmi and a Past General Secretary and Council Member, Professor Clement Emeka Nwawolo among others. Wednesday, the World Health Organization (WHO) declared multi drug-resistant TB (MDR-TB) a ‘public health crisis’ – and released an evidence-packed report to prove it. A lot has been written about what can be done to curb the spread of ‘virtually untreatable tuberculosis’ announced by the U.S. Centers for Disease Control and Prevention. • About one in five of the 94,000 people diagnosed with MDR-TB (resistant to two of most commonly used drugs in the current four-drug regimen) are not being treated. • Only about half of those being treated for drug-resistant TB are successfully completing treatment. Trends suggest this gap is only increasing. • 10 percent of these cases are morphing into extensively drug-resistant TB (resistant to two first line drugs and at least two second line drugs). The world has reached a point where an ancient disease is outrunning all attempts to control it. Despite some visionary political commitments – such as recent U.S. and UK commitments to the Global Fund to Fight AIDS, Tuberculosis and Malaria – ultimately, the global fight against TB is starved of political leadership and funding. The new WHO report reveals this massive disconnect between what is clearly a crisis situation and a lacklustre global response to TB – a disconnect demonstrated by the $2 billion that is lacking annually to mount a smart and effective response to TB in the low- and middle-income countries where it is needed most. This makes no sense – not from a public health perspective, or an economic perspective. There is evidence of the oppressive and unnecessary costs associated with TB and its drug-resistant strains. A recent study showed that tuberculosis (the care of patients and the enormous costs in lost productivity) costs the European Union €5.9 billion per year. According to researchers, this estimate is conservative, as several sets of data were not available and the real costs may actually be twice as high. There is not a national budget anywhere prepared to bear these burdens. The good news: the solutions to this crisis are multifaceted, long-term, and outlined in the ‘priority actions’ of the WHO report. First thing to do At its Fourth Replenishment in December in Washington, D.C., the Global Fund must receive the $15 billion it is requesting from donors to scale up its programmes, save more lives, and ultimately bring these three epidemics under control. Nearly 90 per cent of international donor financing for TB is provided by the Global Fund, and its programmes have put 11 million people on TB treatment. In 2011, Global Fund programmes supported about one-quarter of cases enrolled in MDR-TB treatment. Failing to scale up TB programmes could have a catastrophic impact on the spread of drug-resistance. TB anywhere is TB everywhere. As an airborne disease that can be spread through the simple of act of coughing, decision makers have an obligation to heed the evidence and ramp up the slowing fight against an ancient disease, before its control spins out of grasp. Thanks to the WHO, the evidence is available. There is no doubt on what to do. What is needed now is visionary leadership, particularly the delivery of commitments and new resources for the Global Fund.